Does my Motorcycle have to be damaged, wrecked, totaled, junk in order to qualify for a Motorcycle cash program? No. If you need money and have a motorcycle, ATV, snowmobile, or other recreational vehicle, call us and we will make you an offer. If you agree on our offer, we will pick up the vehicle and give you a check on the spot. How much money can I get for my Motorcycle? At The Bike Buyers, we will negotiate a fair price for your vehicle on the phone prior to coming to your location. There is no need to make any commitment until we have agreed upon a price that works for you. This way, you will know exactly what to expect before we come out to pay you and pick up your vehicle for free. How can I be sure that I will get my money and not be scammed? When you call The Bike Buyers, a company that has been buying motorcycles, ATV’s, snowmobiles, and other recreation vehicles for over 20 years, you don’t have to worry about being scammed. The Bike Buyers is an A+ rated company with the BBB and you don’t earn that prestigious recognition if you have customer complaints. So unless you are a gambling person, don’t leave your selling experience to chance. Call The Bike Buyers today and if we agree to buy your motorcycle, ATV, snowmobile, etc. we will pick it up at your location and hand you a check on the spot. The Bike Buyers is bonded and insured so no games, no worries. Just a straightforward transaction! How long does it take to get money for my Motorcycle? Will The Bike Buyers come to my city? We pickup all Motorcycles in any city in the United States. Just submit your request for a quote by clicking on the ‘Get a Quote Now’ button or call us today. What if I want to sell my motorcycle online? You can still sell your Motorcycle online – that is your choice. However, most sellers end up calling us after they have paid hefty fees to list their vehicle online and have failed to sell. We want to help make your life easier and save you those wasted dollars. We recommend you give us a call to see how much you can get for your vehicle before you try listing it. You may be pleasantly surprised at how much we offer! My Motorcycle is completely totaled Will you still take it? 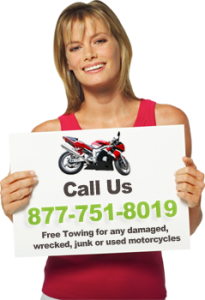 We specialize in helping you get rid of your damaged Motorcycle, wrecked, junk and totaled Motorcycles. Call us today or click on ‘Get a Quote Now’ to see how much cash you could get for your totaled vehicle.